Main Exterior updates of Ertiga Feliz includes silver coloured grille, silver coloured fog-lamp housing and outside rear view mirrors. Special body graphics on the sides till the rear, rear spoiler. Interior updates include styling kit, a new steering wheel cover, reverse parking sensor with digital display, Feliz branded beige seat covers and car pillows, back pocket organizer, door sill guard and floor mats. Comes in VXi trim and VDi trim levels. Above are the main updates coming in the Special edition version. 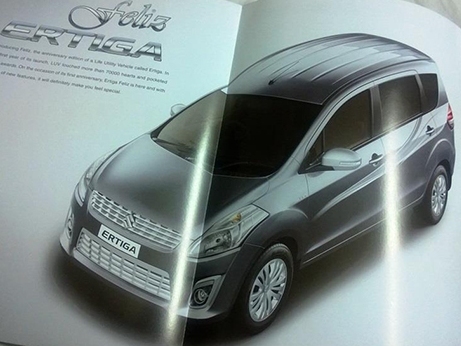 Price and Availability of Special Edition of the Ertiga Feliz deatails are not out currently. Maruthi Ertiga Feliz will compete against vehicles like Chevrolet Enjoy, Ashok Leyland Stile, Evalia, and Xylo in Indian market. Tags:- Maruti Ertiga Feliz details, Maruti Ertiga Feliz features, Maruti Ertiga Feliz specs, Maruti Ertiga Feliz launch, Maruti Ertiga Feliz mileage, Maruti Ertiga Feliz india price, Maruti Ertiga Feliz india details, Maruti Ertiga Feliz india varients price, Maruti Ertiga Feliz variants,Maruti Ertiga Feliz pics, Maruti Ertiga Feliz pictures, Maruti Ertiga Feliz images, Maruti Ertiga Feliz trim levels.